It’s easy to dismiss a co-worker as someone who resists change, or dismiss a student who doesn’t want to put in time and effort on research as lazy. It’s much harder to stop and really try to understand with their position, their motivations, and empathize with them. It’s much harder, but it’s also much more valuable. Aaron Schmidt and Amanda Etches-Johnson did an awesome presentation this fall at the Future of the Academic Library Symposium sponsored by Library Journal and Temple University. One of the main points they made was that the reason we have user gaps and a disconnect between patrons and librarians is because of a lack of empathy. We design resources and services that make sense to us, but do not fully take into account our users. This is at the core of user experience design. To be able to best serve our users, we need to really understand them. This involves talking to them, having conversations with them, and asking for their feedback. In these conversations it’s easy to jump to conclusions and say things in your mind like, “that would never work,” or “they just don’t understand how things work here.” This is exactly why there are gaps in service in the first place. Really understanding someone’s position means not judging it or jumping to conclusions. It means seeing it for what it is. Often problems are much different that what we prematurely judge them to be. 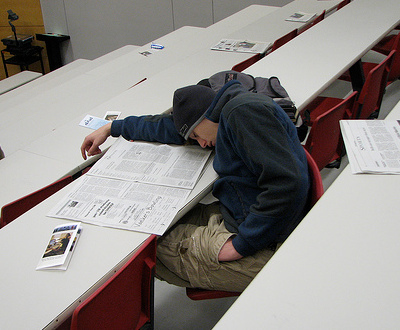 Perhaps a student appears lazy because they have no interest in the topic they chose and therefore no motivation. This is a very different problem than laziness. We also need to bring this level of understanding and empathy into our relationships with colleagues. Whether it’s another librarian who you see as change resistant or a professor who is very particular, instead of writing them off as being set in their ways or being difficult, we should try to really put ourselves in their shoes and understand their position. Perhaps this professor or colleague doesn’t actually get listened to that often. Their ideas, responses, and concerns might be enlightening. We have our own lenses through which we see the world, and these are very different from other people’s lenses. The next time you find your self getting frustrated at a colleague or a student, try to sincerely understand where their coming from and see things through their lens. That shared understanding will make you less likely to be frustrated and will bring you closer to solving the problem that you’re working on.